Blue sky Have you ever wondered why sky is blue? A lot of other smart people have, too. Let's figure it out! John Lubbock – A famous liberal politician, Philanthropist and a scientist says about the nature and the Blue sky, "Earth and Sky, woods and field, lakes and rivers, the mountain and the sea, are the excellent school masters and teach us more than we can ever learn from books". The Sun produces white light, which is made up of light of all colors: red, orange, yellow, green, blue, indigo and violet (ROYGBIV). This was demonstrated by Isaac Newton, who used a prism to separate the different colors of sunlight and so form a spectrum. We know that atoms and molecules re–emit light waves as we shine on them. Likewise even the tiny particles would do the same. The tinier the particle, the higher the frequency of light it will scatter. The nitrogen and oxygen molecules that make up most of the atmosphere scatter high frequencies when energized by sunlight. The re–emitted light is sent in all directions and is scattered. Most of the ultraviolet light (UV) from the sun is absorbed by a thin protective layer of ozone gas in the upper atmosphere. The remaining ultraviolet sunlight that passes through the atmosphere is scattered by the particles and molecules in it. Violet light is scattered the most, followed by blue, green, yellow, orange, and red, in that order. Red is scattered only a tenth as much as violet. Although violet light is scattered more than blue, our eyes are not very sensitive to violet light. But they are sensitive to blue –– so we see a blue sky! Why does complexion of sky vary at different places? 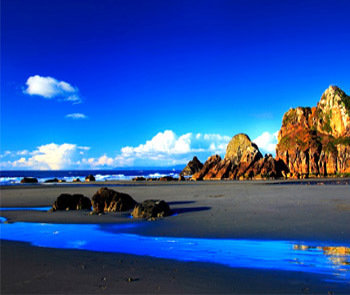 The blue of the sky varies in different places under different conditions. A principal factor is the water–vapor content of the atmosphere. On clear, dry days the sky is a much deeper blue than on clear days with high humidity. Places where the upper air is exceptionally dry, such as Greece and Italy, have beautifully blue skies that have inspired painters for centuries. Where the atmosphere contains a lot of particles of dust and other particles larger than oxygen and nitrogen molecules, light of the lower frequencies is also scattered strongly. This makes the sky less blue, and it takes on a whitish appearance. 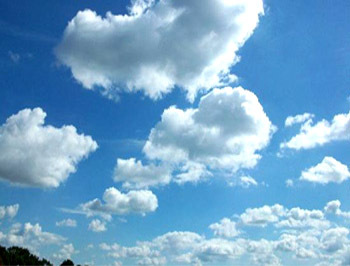 After a heavy rainstorm when the particles have been washed away, the sky becomes a deeper blue. The grayish haze in the skies over large cities is the result of particles emitted by bus, car and truck engines and by factories. Even when idling, a typical automobile engine emits more than 100 billion particles per second. Most are invisible but act as tiny centers to which other particles adhere. These are the primary scatters of lower–frequency light. The largest of these particles absorb rather than scatter light, and a brownish haze is produced. Frequency of blue and red colors Blue light has a higher frequency and a shorter wavelength than red light. Why is blue color scattered more? Light consists of weightless particles (that contain no mass) traveling at about 186,000 miles or 300,000 kilometers per second. These particles of light are called photons. But light also exhibits the characteristics of a wave. Light is an electromagnetic wave. If you stand in one spot as a light wave passes by, there will be an oscillating electric field and an oscillating magnetic field, which are perpendicular to each other. 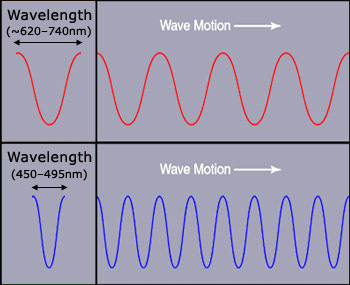 Light wave has a frequency and a wavelength. As the frequency increases, the wavelength decreases and as the frequency decreases, the wavelength increases. The frequency of light determines its color. Blue light has frequency in the range of &Tilde;670–610 THz whereas for red light it is &Tilde;480–400 THz. Hence Blue light has a higher frequency and a shorter wavelength than red light. Our eyes are sensitive to only a small part of the spectrum of frequencies. There is ultra–violet and infrared light just beyond our eyes range, radio waves with much lower frequencies than light, and gamma rays with much higher frequencies. Sunlight contains many different colors, which can be separated through a prism or a rainbow into different colors. If the light is in the range of frequencies that we can see, then the frequency of the vibration affects the color of the light. Electric dipole induced due to electric field of EM radiation. The electromagnetic field of the light waves induces electric dipole moments in the molecules. What happens at atomic scale in scattering? The oxygen and nitrogen molecules in the air are able to scatter light because the electromagnetic field of the light waves induces electric dipole moments in the molecules. These molecules are electrically neutral, but they are made of charged objects: their atoms consist of negatively charged electrons and positively charged nuclei. If there is an electric field at the position of an atom, the nucleus will move a short distance in the direction of the field and the electrons will move the other way, and the atom will become a “dipole”: the positive and negative charge will be centered around different places. A molecule made of such atoms will acquire its own electric field, something like the magnetic field of a bar magnet. Electric field of EM radiation The eyes of various organisms sense a somewhat variable but relatively small range of frequencies of EM radiation called the visible spectrum or light. A dipole's electric field falls off more rapidly with distance than it would if the molecule had a net electric charge. This is because at large distances, the fields from the positive and the negative charge tend to cancel each other out, as the difference between their average positions becomes less important. However, if the dipole is made to oscillate that is, if the positive and negative charge wiggle back and forth, out of phase with each other, then the molecule can produce electromagnetic radiation of its own. This is how air molecules scatter light: the oscillating electric field of the incoming wave makes the molecules develop oscillating dipoles, which in turn give off radiation. The radiation destructively interferes with the incoming wave in the forward direction. The original wave is lessened in intensity, and new waves move out in all other directions, so that overall energy is conserved. The net effect is that light energy that was moving in a straight line from the sun ends up traveling in some other direction. With reference to adjacent figure, when we look at the sky, we see blue everywhere (a); since the blue light is absorbed by the gas molecules and radiated out. When we look at the Sun, it looks white or yellow (b) as usual; this is because; the longer wavelengths directly pass through the atmosphere and appear white (with hints of red, orange and yellow which have a minor effect). As we look forward towards the horizon, the blue color becomes paler(c); since the scattered light has to pass through more air to reach us. Gas molecules scatter sunlight Air molecules individually scatter sunlight into all directions. Blue light is scattered much more strongly than longer wavelengths. The air above us looks blue from that scattered sunlight. 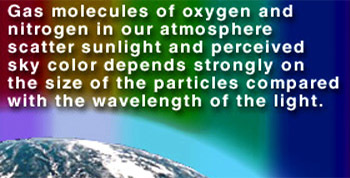 We know that our atmosphere around the Earth is largely made up of two colorless gases: oxygen and nitrogen. Red and blue light reacts very different from each other to oxygen. Because the wavelength of blue light is roughly the size of an atom of oxygen, blue light interacts with the oxygen and is scattered by it, while red light, with its longer wavelength, goes right pass the oxygen atoms. Because it has a shorter wavelength, blue light is scattered ten times more than red light. If the Earth had no atmosphere, the sun&apos;s light would travel directly from the Sun in a straight line towards our eyes and we would see the Sun as a very bright star in sea of blackness. But because the Sun&apos;s blue light is scattered by the oxygen in the atmosphere, blue light from the Sun enters our eyes from all sorts of different angles and we see the entire sky as blue. Wherever we look towards the sky, some light is bouncing off an oxygen atom and entering our eyes, making the sky appear to be blue. Tyndall effect of sunlight The wavelength of the blue light scatters better than the rest, predominates over the other colors in the light spectrum, and makes the sky appear blue to us. The sky appears blue to us on a clear day, because the atoms of nitrogen and oxygen in the atmosphere separate the Sun&apos;s white light into its many colors, and scatter them throughout the atmosphere. The wavelength of the blue light scatters better than the rest, predominates over the other colors in the light spectrum, and makes the sky appear blue to us. The scientific name for this phenomenon is the Tyndall effect, more commonly known as Rayleigh scattering after Lord Rayleigh, who studied it in more detail a few years later. Rayleigh scattering is where red, orange, yellow, and green are passed through and blue, indigo, and violet are “scattered” out creating the color. John Tyndall in 1859 discovered that when light passes through a clear fluid holding small particles in suspension, the shorter blue wavelengths are scattered more strongly than the red. Cones formed inside retina. Although violet light is scattered more than blue, our eyes are not very sensitive to violet light. But they are sensitive to blue –– so we see a blue sky! Why the sky doesn't appear violet? If shorter wavelengths are scattered most strongly, then there is a puzzle as to why the sky does not appear violet, the color with the shortest visible wavelength. Our eyes perceive color using structures called cones. Our retinas bristle with about 5 million cones each, made up of three types that specialize in seeing different colors. The cones are either considered to be red, or blue, or green, based upon their strong response to light at these wavelengths. As light stimulates these receptors, our vision translates the signals into the colors we see. Although each kind of cone is most sensitive to certain peak wavelengths, the ranges of the cone types overlap. As a result, different spectra and the spectral combinations can be detected as the same color. Our eyes and brains interpret certain combinations of wavelengths as a single, discrete color. When gazing at the sky, the red cones respond to the small amounts of red light scattered, and even less strongly to the orange and yellow wavelengths. Although green cones respond to yellow, their response to scattered green and green–blue wavelengths is stronger. Finally, colors near the strongly scattered blue wavelengths stimulate the blue receptors. In short, the skylight stimulates the red and green cones almost equally, while stimulating the blue cones more strongly. For these reasons, our vision naturally adjusts as clearly as possible to separate colors. Our visual sense interprets the blue–violet light of the sky as a mixture of blue and white light, and that is why the sky is light blue. With reference to adjacent figure, as white light from the sun passes through the atmosphere, colors with longer wavelengths, such as red, orange and yellow, pass through. On the other hand shorter wavelengths like blue and violet wavelengths are absorbed by the gas molecules and scattered across the sky. 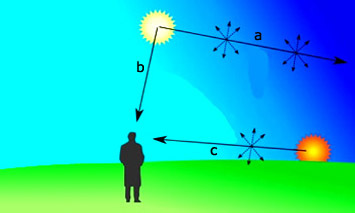 Hence viewers - A, B, C sees these reflected wavelengths as different shades of blue and finally the viewer D sees longer wavelengths like red or orange only. Sunset Sunlight (what we call "white light") is made up of all different colors of light, each having a different wavelength. During a sunset, more red light is scattered towards you, because of aerosols in the lower atmosphere, compared to the amount of blue or green light that is scattered. Why the sunset/sunrise is reddish orange? At noon sunlight travels through the least amount of atmosphere to reach the Earth&apos;s surface. Only a small amount of high–frequency light is scattered from the sunlight, enough to make the sun look yellowish. As the day progresses and the sun drops lower in the sky, the path through the atmosphere is longer. During sunrise and sunset, the Sun is low in the sky and its light reaches us only after passing a long way through the dense lower layers of the atmosphere because instead of dropping directly through the atmosphere, it reaches the Earth at an angle. Sunlight travels through more atmosphere at sunset, and that is why sunsets (and sunrises) are red. The same scattering effect on the blue light, also takes place, but the blue light is unable to pass through the extra distance and reach our eyes. Light that isn&apos;t scattered is light that is transmitted. Because red, orange, and yellow light are the least scattered by the atmosphere, light of these lower frequencies is better transmitted through the air. Red, which is scattered the least, and therefore, transmitted the most, passes through more atmosphere than any other color. So the thicker the atmosphere through which a beam of sunlight travels, the more time there is to scatter all the higher-frequency components of the light. This means the light that best makes it through is red. Hence we see the Sun&apos;s disk red. We don&apos;t see the entire sky red because there is no scattering and the red light reaches us in a direct line. Everyone knows that a sunset is the most colorful part of the day, but not many people know why that is. The red, orange, pink, and sometimes green is caused by something called the Rayleigh scattering. This is a scattering of electromagnetic particles with wavelengths smaller than the light being given off from the sun. This scattering is more intense and noticeable during sunset. Can we have multi-colored sunset? When the air is clear the sunset will appear yellow, because the light from the sun has passed a long distance through air and some of the blue light has been scattered away. 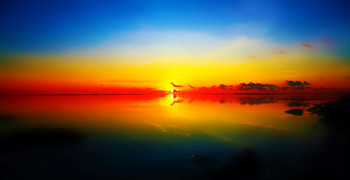 If the air is polluted with small particles, natural or otherwise, the sunset will be more red. 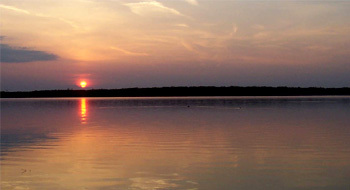 Sunsets over the sea may also be orange, due to salt particles in the air, which are effective Tyndall scatters. The sky around the sun is seen reddened, as well as the light coming directly from the sun. This is because all light is scattered relatively well through small angles – but blue light is then more likely to be scattered twice or more over the greater distances, leaving the yellow, red and orange colors. A multicolored sunset over the Firth of Forth in Scotland is shown in the figure. Mars sky is red because of iron–rich dusts thrown up in the dust storms occurring from time to time on Mars. The color of the Mars sky will change according to weather conditions. It should be blue when there have been no recent storms, but it will be darker than the earth&apos;s daytime sky because of Mars thinner atmosphere. It also has a constant haze of dust in the air that contains a brown iron oxide called limonite, which absorbs blue light and scatters the other wave lengths of visible light.